In my years working in the music industry, I’ve seen shows in all kinds of unique settings: churches, rooftops, Manhattan piers – any number of strange venues. Last week’s Portugal. The Man performance at Ron Russell Middle School at 8am probably takes the cake though. 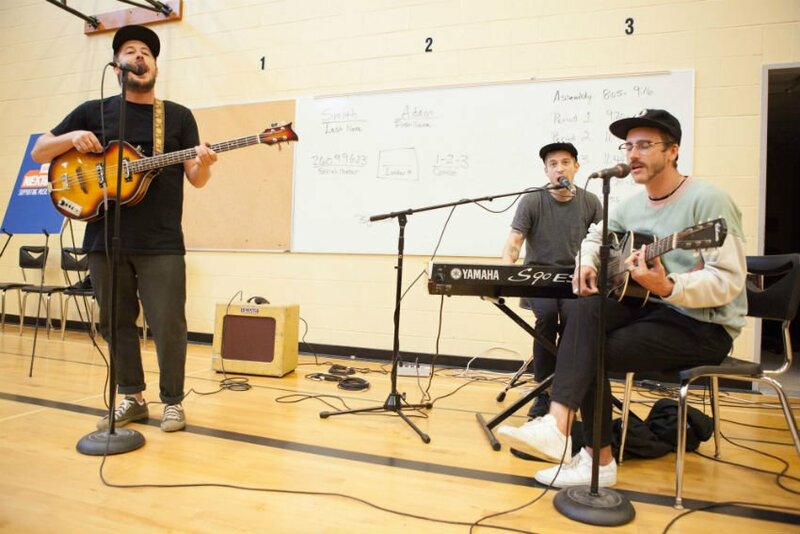 In an unbelievably cool move, the Portland-based band teamed up with The Mr. Holland’s Opus Foundation and Stubhub to present the school with a whopping 35 grand in brand new musical instruments. It’s hard to think of a more deserving school than Ron Russell, as the music department boasts an impressive six bands, six orchestras and three choirs. From the obvious pride beaming from the teachers and principles faces, to the cheers and smiles from the students once the surprise was revealed, it seemed apparent the entire school was more than deserving of the generous donation. After speeches by band and orchestra directors Tawnya Garcia and Tammy Culp (whose passion for their work was palpable), a few students got a chance to speak at the microphone briefly about their love of music, which was beyond endearing. 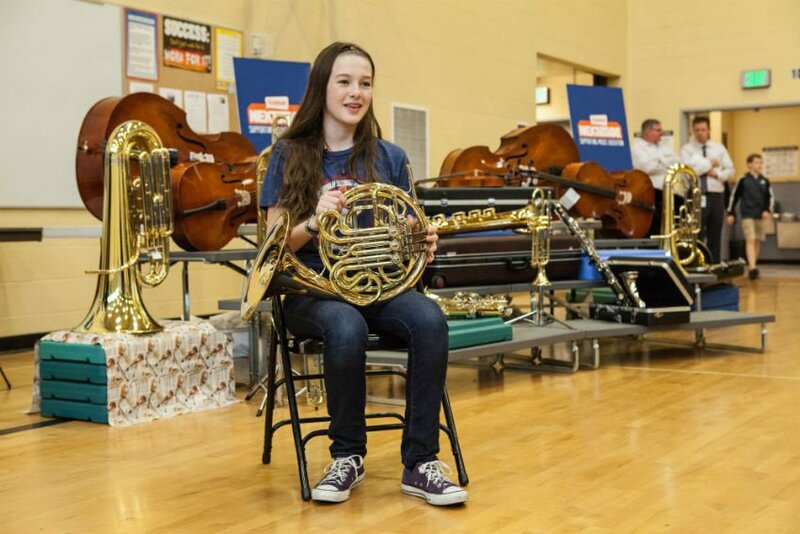 White sheets were then pulled away from a mysterious table revealing gleaming new instruments of varying types and eliciting gasps and smiles from the kids in the audience. I looked over at one of the students who had spoken earlier (and very sweetly said “Music makes me feel like I can do anything”) after the reveal and the look of joy on her face was one I won’t soon forget. The band then said a few words about how they got their start playing in school band and orchestra (again I saw some young faces light up upon hearing this) and then played a three song set that included “Purple, Yellow, Red and Green” (a selection I found a bit amusing considering some of it’s lyrics, but it’s best not to look a gift horse in the mouth, nor question it’s setlist). The band then met with reporters and some of the kids after, reiterating their belief in the importance of programs like The Mr. Holland’s Opus Foundation. A couple of the children who had spoken to their classmates earlier received an even bigger thrill when they were interviewed by the television stations in attendance. 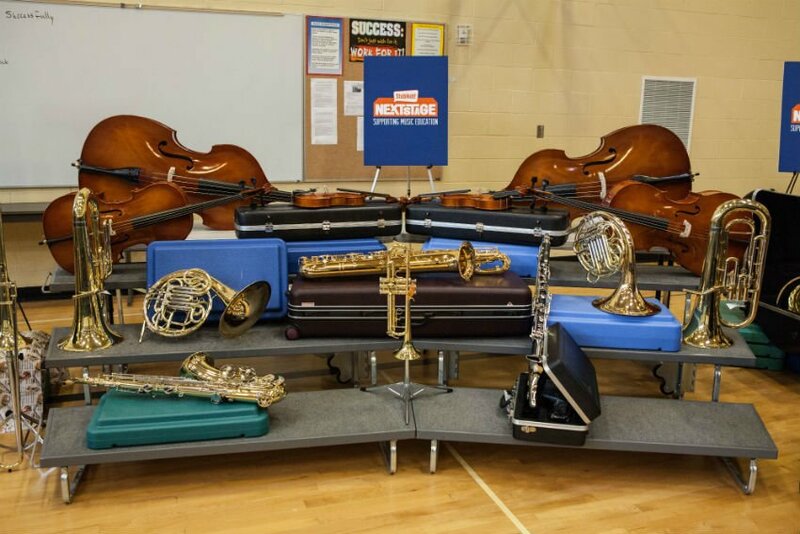 As suspicious as I am of corporate money machines like Stubhub, they certainly deserve a lot of credit for giving the Mr. Holland’s Opus Foundation $1 million worth of instruments for donation around the country this year. And obviously the Foundation deserves oceans of kudos for their ongoing and selfless work helping schools promote music, as does the band for truly caring about such an important and selfless topic. But most of all I’d say the staff (Especially Tawnya Garcia and Tammy Culp) and students at Ron Russell deserve a great deal of attention for showing such continuing musical excellence, as this isn’t even the first time they have earned a grant from the Foundation: in 2010 they also received a sizable donation. Three cheers for all involved, and let’s hope I’m writing about a few of these young whipper snappers and their bands down the road. Hey, they can already say they opened for Portugal. The Man.